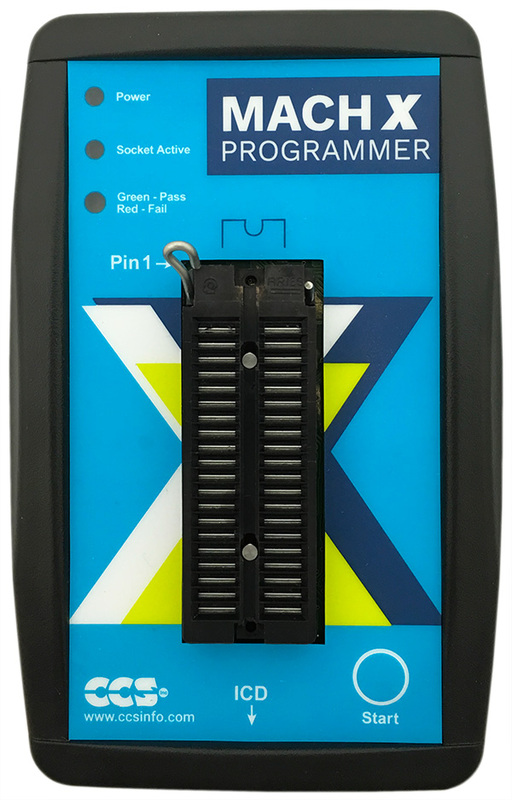 The Mach X Programmer is a full-featured device programmer that programs all Microchip PIC® MCU, Flash devices, and One-Time-Programmable (OTP) devices. Program various DIP chips (8-40 pins) directly from the on-board 40-pin ZIF socket. The unit also provides ICD & ICSP functionality and debug support covers all targets that have debug mode when used in conjunction with the C-Aware IDE Compilers. CCSLOAD FREE programmer control software supports the Mach X and offers many new key features including; powerful command line options in Windows/Linux, extensive diagnostics, easy to use production interface, and enhanced security options. Mach X can be paired with Tag-Connect, a cost saving production ICSP Programming cable that eliminates the need for an ICSP connector on your product. Tag Connect provides a direct pin-to-circuit connection, saving space on your PCB. The modular end works with existing ICD programmers as well as the Mach X.